is an anthropology research assistant at Harvard University. is Dumbarton Oaks Professor of Pre-Columbian Studies in the Department of Anthropology at Harvard University. His latest book is Inka History in Knots: Reading Khipus as Primary Sources (2017). The Inka empire (1400-1532 CE) is one of few ancient civilisations that speaks to us in multiple dimensions. Instead of words or pictograms, the Inkas used khipus – knotted string devices – to communicate extraordinarily complex mathematical and narrative information. But, after more than a century of study, we remain unable to fully crack the code of the khipus. The challenge rests not in a lack of artifacts – more than 1,000 khipus are known to us today – but in their variety and complexity. We confront tens of thousands of knots tied by different people, for different purposes and in different regions of the empire. Cracking the code amounts to finding a pattern in history’s knotted haystack. Using locally available materials such as camelid fleece and cotton, the khipukamayuqs (Quechua for ‘knot-makers/animators’) encoded administrative data such as census figures and tax allocation in the twisted strings of these ancient spreadsheets. The Inka bureaucrats used these data to keep tabs on the largest empire in the pre-Columbian Americas. We have known for about a century that the accounting khipus follow a base-10 knot scheme (imagine an abacus made out of string). However, these quantitative khipus account for only about two-thirds of the samples remaining today. The remaining third of these devices – the so-called narrative khipus – appear to contain encoded non-numerical, narrative information, including names, stories and even ancient philosophies. For those who love puzzles, the narrative khipus are a godsend. What is so radical about wrapping numbers in knots? Consider how we typically learn to count. In school, counting begins with objects – wooden blocks, Lego pieces or other toys. Addition and subtraction involve making piles of these objects or tallying with our fingers. Then fingers and blocks turn into two-dimensional formulas, as students are taught a series of mathematical figures, commonly called ‘ciphers’. As a result, we can lose our ability to appreciate numbers as being represented by anything other than these abstract written symbols. Think about it: is there anything about the symbol ‘7’ that communicates the meaning of seven? By contrast, the Inka khipu code for seven was a special type of knot, made by wrapping the string around itself to make a series of loops – seven, to be exact. Then there are the narrative khipus. These might have used numbers as qualitative identifiers for people or ideas – consider how we are each identified by a phone number, social security number or street address. This raises an important question: when numbers can signify quantities, identities or some combination of both, how do we know what category of number we are looking at? In other words, might a knot that signals the number ‘3’ reflect a count of three pesos, an identifier of a local villager or perhaps an emerging postal-code system? Some scholars have even suggested that the knots themselves encoded syllabic language. The search for a narrative ‘Rosetta khipu’ amounts to finding a match between the text of a Spanish document and the knots of twisted strings. Given these complexities, how confident can we be in our ability to learn about the narrative khipus, when they are so radically different from our understandings of communication? We are trained from an early age that mathematics and language are two discrete worlds. The Inkas, however, collapsed them into a three-dimensional construct – an achievement of civilisational complexity in the form of narrative cords. This complexity makes it surprising that the Inkas are often remembered for what they lacked, when compared with our modern society. South America is the only continent (besides Antarctica) on which no civilisation invented a system of graphical writing for more than 10,000 years after the first people arrived. We are yet to confirm a pre-conquest event knotted in contemporaneous records. The Inkas have even earned a spot on the list of original ‘pristine’ civilisations – commonly identified as Egypt, Shang China, Mesopotamia, the Mayas and the Inkas – despite being the only nation that never invented the wheel, markets or writing. The danger in this view is judging the past through the lens of the present. It is easy to view the past as a simpler time, where the Inkas never stumbled upon the wonders of modern communication. The ‘despite’ qualifier hides a troublesome assumption of our own superiority: what follows ‘despite’ but a list of our own, modern comforts of life (the wheel, markets, etc)? The khipus might seem bizarre to us, but the Inkas, who were the inheritors of a long tradition of weaving with cotton and camelid yarns, were unique and highly creative – not underdeveloped – in their approach to documenting language. Pencil and paper is not the only road to progress. In fact, the use of knotted cords was an important adaptation to living in the Andes, one of the most challenging geographies on Earth. Chaskis (Inka messengers) navigated the steep slopes of the Andes on foot, carrying one of the world’s most durable and portable envelopes: a khipu draped over each shoulder. The next time you try to retrieve your mail in a rainstorm, consider the ingenuity of the western hemisphere’s oldest postal service – a postcard you can hang out to dry. Just as ancient texts help us to understand other early societies, detailed study of the khipus illuminates the intentions of the people who tied these knots so many centuries ago. In fact, not only are the khipus mathematically complex, but they also reveal to us a civilisation of kaleidoscopic complexity that mirrors our own in uncanny ways. For the Inkas, taxes were an ongoing obligation, and assessed at different times throughout the year. The khipus constitute one of the world’s oldest repositories of tax data, linking names, tax brackets and household information through knots. Imagine if at any time, an IRS agent might show up at your doorstep to check your compliance with each and every part of the tax code? Under the Inka empire, and especially after the Spanish conquest in 1532, this was a day-to-day reality. In fact, we recently wrote about a rediscovered set of khipus from coastal Peru that was dedicated to this very goal. 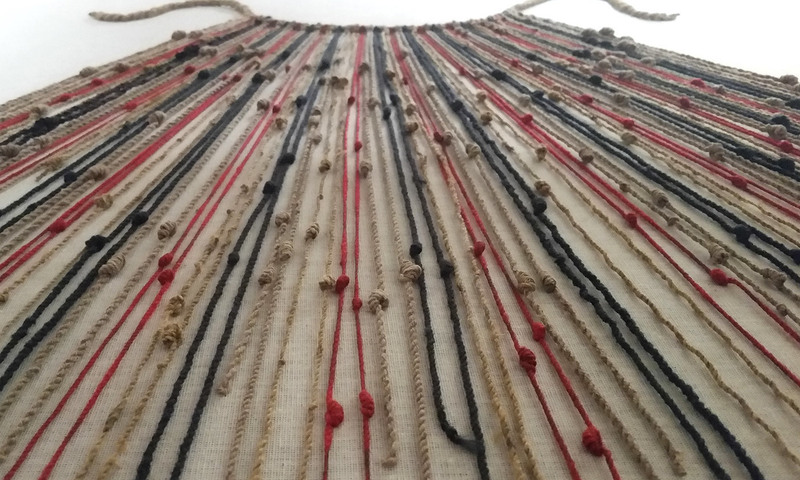 Spanish administrators in post-conquest Peru, in efforts to subdue and control the population, compelled the khipukamayuqs to narrate their khipus – cord-by-cord – while a scribe recorded the hidden meaning of the knotted strings. This process created a pair of linked archives: one in paper, the other in knotted strings. Our recent studies suggest a path toward deciphering a set of such taxation khipus, moving us closer to a much-anticipated Rosetta moment. Big government was a staple of both pre- and post-conquest Andean life. Khipus and censuses were methods by which the Spanish kept track not only of people’s taxes but also of where they belonged in society – one’s clan, social rank, occupation and tax contribution – all recorded together in knots. This information was not private; many censuses involved corralling an entire village in a central square and entering their individual data into khipus, person-by-person, in a powerful and very public display of force by the conquering government. Recent efforts to record khipu data demonstrate the relative ease of converting khipus to modern spreadsheets, and the effectiveness of these early accounting methods. In some instances, khipus actually contained tax-tracking information – in checks-and-balances accounting – that is just as accurate as our modern systems. Mathematics involved more than just arithmetic for the Inkas. The khipus present us with numbers in three dimensions – their knots represent quantities through a complex combination of shape, spin direction and relative position. For the Inkas, numbers were an integral part of social life: Spanish records tell us that the Inkas placed numbers in space, their three-dimensional number line conceiving of quantity as distance from the body. All too often, we reserve maths problems for school or puzzles on long flights. The khipus confront us with the challenge of cracking one of the sudokus of the ancient world, an advanced puzzle filled with both numbers and words. It is tempting to view the march of progress as an uphill climb to the present moment, and the wheel, markets and writing as hurdles cleared in the arduous trek toward advanced civilisation. Modern-day customs are the lens through which we view the past, defining success – our own condition – with a ‘despite’ clause for others who don’t follow our own path. In reality, the Inkas’ 3D records are intimidating because they are so radically outside the comfort zone of modern society and communications technologies. The Inkas managed to centralise and collapse mathematics, language, accounting and history into a durable and portable recording device. Their khipus are a perfect example of why it is dangerous to judge the past through the lens of the present. If ancient peoples were ‘primitive’, then we must be as well – the Inkas and the narrative khipus have, after all, managed to baffle us so far.